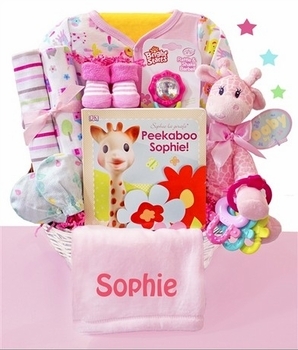 The cute safari animals just can't wait to welcome the new bundle of joy in this adorable girl baby gift basket! This design is filled with jungle animal toys and other newborn essentials that the new family will definitely appreciate. The security blankets are soft and plush while the minky soft travel blanket can also be personalized and embroidered with her name for an ultra-thoughtful gift.